If you’d like to get better acquainted with the works in the Gallery as well enjoy a sample of what the restaurant has to offer then this is the tour series for you. 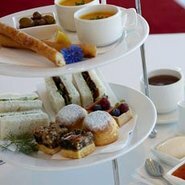 One of our experienced guides will reveal the intricacies of the art and then lead you to high tea at the restaurant. Come and sate your appetite for fun facts and superb stories and then discuss tour highlights over an assortment of savoury and sweet treats. Three full working days (Monday–Friday) notice is required to qualify for a refund. All refunds attract an administration charge of 25% of the ticket price(s) with a minimum charge of $5. Not negotiable. The 30th anniversary of ARTEXPRESS at the Gallery showcases dynamic student artworks created as part of the HSC examination in Visual Arts. The broad range of approaches and diverse, expressive forms throughout the exhibition will offer you the chance to see what’s making today’s art students tick. Featuring major and often confronting work by 11 contemporary Australian artists from around the world, this exhibition explores the emotions of love, the pleasures of the flesh and the wistful nostalgia of recollection. We used to talk about love considers the colourful terrain of love’s language – joy, elation, longing, loss, melancholia and memory. The Kenneth Reed Collection shows a magnificent selection of 18th-century porcelain, ranging from the pleasingly eccentric to the the sublimely beautiful. Gain an understanding of how the interaction between East and West turned human culture into a global phenomenon for the first time. This is your chance to experience the brilliance of new media art. Established in 2002 in honour of a former trustee of the Art Gallery of NSW, the Anne Landa Award was the first biennial exhibition in Australia for moving image and new media work, with an acquisitive prize of $25,000, and has maintained its significance ever since. Feel like you need a little help dissecting contemporary art? The display on lower level two of the Gallery provides scope to discover the progression of modern and contemporary art over the past 40 years and your guide will help you find your own entry point into a collection of thought-provoking works. In the decades between the two world wars, progressive artists explored and promoted modernity through revolutions in colour and light. This is your chance to experience their exuberant, cosmopolitan paintings, prints, sculptures and designs, which represent one of the most distinctive and innovative periods in the history of Australian art. Celebrating 60 superb years of events and acquisitions, this tour will focus on the contributions our members organisation – the Art Gallery Society of NSW – has made to adorning the walls of the Gallery. Since 1981, the Gallery has made a major commitment to the work of Bill Henson through acquiring his photography. A selection of his works has been brought together, highlighting his figure studies and ‘landscapes’ and emphasising his mastery of digital printing. October is Sculpture by the Sea time, so inevitably there’ll be sculpture in the air. This is your opportunity to learn more about the three-dimensional works throughout the Gallery as we turn the spotlight on sculptures in our collection. Yiribana means ‘this way’ in the language of the Eora people and acknowledges the location of the Gallery on Cadigal land. Let us navigate you through the intricacies of, and history behind, our Aboriginal and Torres Strait Islander collection.